My Fun Hatchback Turned Out To Be Boring! What Car Should I Buy? Tricia bought the car that we recommend to almost everyone: the Mazda3 hatchback. It turns out the little Mazda wasn’t as exciting as she expected and now she is looking for something with a bit more performance. What car should she buy? I am currently driving a 2014 Mazda 3 hatchback and it’s just... boring. It’s an automatic, which might have been my big mistake in the purchase. My previous car was a manual red 2005 Audi TT. I miss it so much but it isn’t really practical for my life - which is the reason why I sold it. I miss driving a stick shift and having something zippy I can take out on the back roads on the weekend. I have a large dog (70 lbs) who needs to fit in the backseat as well. I am planning to sell the Mazda, but would consider keeping it if I found something well under budget that fit the bill as a weekend car - in which case a lot of my other requirements are flexible - in that case I would love a convertible! However, if I’m going to upgrade the Mazda I’m thinking I would like a luxury car like a BMW or Audi. I know both offer manuals in various cars, the only problem is that I live in Alexandria, VA which is full of BMWs and Audis so it would nice to have something different. Tricia, I can relate to your situation and your boring Mazda3. I had a 2010 Mazda3 and while it was a very good and enjoyable car, I too longed for a bit more pizazz out of it. The thing about the Mazda3 is it is essentially a regular commuter car that is just a bit more fun to drive than the others. It is not really a performance car. Now I was fully ready to recommend that you buy a supremely awesome E90 M3 from CarMax and have you budget a little more for that MaxCare warranty. But if I’m honest, that’s not really a good choice for you—the miles are high and it’s just too over the top. You should do what I did and get a brand new Volkswagen GTI. You will get your fun German performance car, but with a full warranty and no worries about how much abuse it took from a previous owner. The GTI also has a very nice interior that will rival luxury cars that cost much more. While it’s not quite on the same level as an M3, I have yet to find a situation in my daily commute where the 220 HP and almost 260 lb-ft of torque were inadequate. However, if you do ever long for more, an ECU tune for around $700 bucks will inject the GTI with a serious helping of power and give that 74,000 mile M3 a run for its money. Expert #2: Patrick George - What IS Luxury? Tricia, I’m sorry our usual recommendation didn’t work out for you. If those bastards at Mazda would ever put a turbo (or two!) on the Mazda3 it would solve a lot of problems. But here we are. Speaking of turbos, I believe I have a practical solution in your price range and it is the Subaru WRX. Practical? Check. Doors? Four of ‘em. Manual? Absolutely. If you buy the CVT, just don’t tell me about it. It’s got plenty of power, fantastic handling and the added capability of all-wheel drive. Now you did say you want a luxury car. To this I ask: what IS luxury? Because the days of anything that isn’t a Cadillac or a BMW or whatever being a total shitbox are long gone. These days you can get a WRX with heated leather seats, satellite radio and Subaru Eyesight, one of the best safety systems in the industry. Or you could spend a hell of a lot more on a German luxury car for similar equipment. Your choice. Hey Tricia, remember when you said this? ... if I found something well under budget that fit the bill as a weekend car - in which case a lot of my other requirements are flexible - in that case I would love a convertible! Right there, that’s your answer. 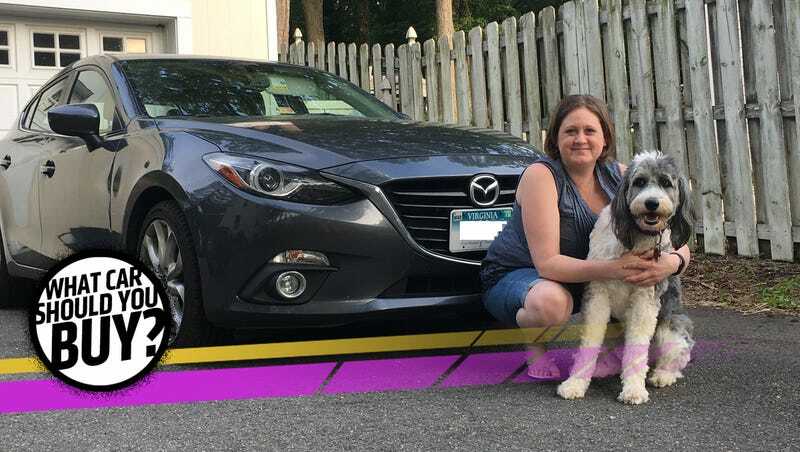 Your Mazda 3 is going to be just fine as your basic, dog-and-life hauling vehicle; why try to force every wildly varied desire you have for a car into one vehicle? That just means compromise, and compromise, while useful, isn’t fun. That’s why you had the right idea with the weekend car. You need something that’s fiercely non-boring, and boy do I have the thing for you: right nearby, around DC, lives this immaculate bright yellow 1980 MGB, ready to de-boringify your life. Plus, MGBs are common enough that parts and service shouldn’t be a big deal. Look at that thing! It is fun, turned into metal and rubber via a proprietary British technique, and it’s ready for you to enjoy the crap out of. It’s manual in every way, fully restored, and, at under $5700, well under your budget so you can justify it as a weekend joy-giver. MGBs aren’t the fastest thing around, but you sure as hell can’t tell that when you’re driving one, flat out, wind in your hair and having a blast. Plus, you’ll be able to spot it in a parking lot full of gray BMWs and Audis from space. Keep the Mazda, and get this. Automotive polyandry is the way to go here. My Awesome Toyota MR2 Got Killed By A Prius! What Car Should I Buy? I Got Divorced So I Want An Adventure Vehicle For Me And My Dog! What Car Should I Buy? I Have $30,000 And I Need Something Stupid! What Car Should I Buy?